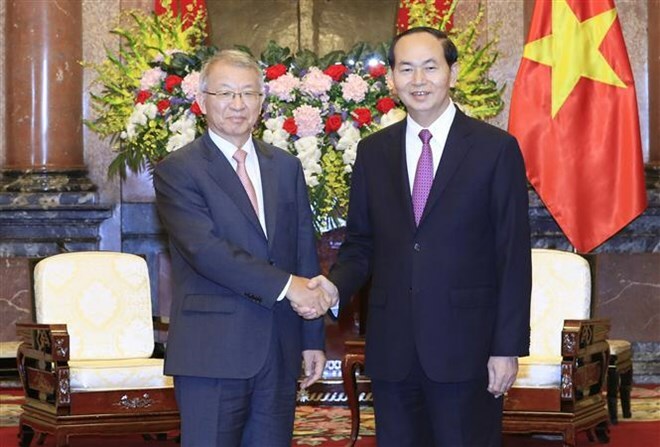 Hanoi (VNA) – President Tran Dai Quang, on August 28, received Chief Justice of the Supreme Court of the Republic of Korea (RoK) Yang Sung-tae, who is on his first visit to Vietnam. Welcoming the Korean guest, the President lauded outcomes of his guest’s talks with Chief Justice of the Supreme People’s Court of Vietnam (SPCV) Nguyen Hoa Binh. He stated the Vietnamese State strongly supports court cooperation with the RoK, stressing the importance of the ties amid the current radical reform in Vietnam. Quang encouraged the SPCV to boost cooperation with RoK partners, including the Supreme Court and Korea International Cooperation Agency (KOICA), to learn from their experience in improving the judiciary. He thanked the RoK Supreme Court for helping Vietnam train judges and court personnel, sharing judicial experience, and implementing the Vietnam Court Academy project. The President said he expects a project between the SPCV and KOICA on boosting transparency and quality of judgment in Vietnam to soon begin, as it is significant to Vietnam’s judicial reform as well as to bilateral court cooperation. For his part, Yang Sung-tae said based on growing Vietnam – RoK strategic partnership, his agency and the SPCV have been working closely together, particularly in exchanging high-ranking delegations and judicial experience. Reporting to his host on the Vietnam Court Academy project, which began in 2009, the RoK Chief Justice said its two phases have been completed with encouraging outcomes. He asked President Quang to support future projects between the two countries’ court sectors.